We are a community of college students, alumni, educators, and adults interested in the college world. We come from various parts of Italy and the world: in this chapel there is a particular tendency to have people who come from far away (Albania, France, Poland, Russia, but also Sicily, Puglia, Calabria, and Sardinia). If you too believe in God’s promise, or even if you are searching for a relationship with God, then you are welcome among us. To give you an idea, you can: see this year’s activities, get directions, or find out how to contact us. 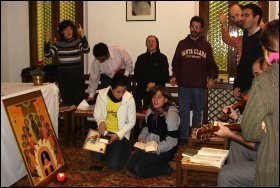 Together with the entire Church and with those who work with the pastoral university of the Bishop of Padua, we unite in a small chapel in the center of Padua and we search, together with many religious people, to listen to, pray, live, and announce the word of God. While at times this experience asks for commitment and responsibility, it is nonetheless very rewarding and fun: we are waiting for you.